← Chanukah Giveaway! Choose Your Own Prize! Living Emunah, by Rabbi David Ashear, was an instant best-seller and an immensely popular book that transformed the lives of tens of thousands of people, taking them on a breathtaking journey towards tranquility and happiness – through faith. 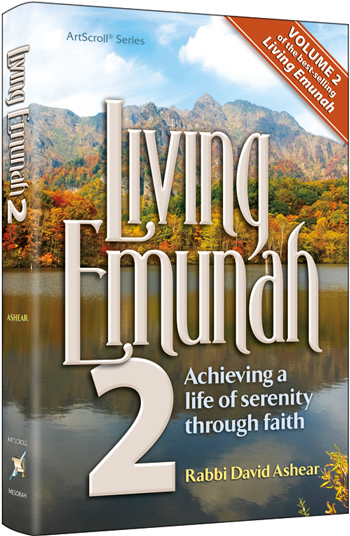 Now, the eagerly anticipated follow up volume, Living Emunah 2, brings us even further on the road to serenity. In just a few weeks, Living Emunah 2 has become an instant best-seller as well. To give you a taste of the life-changing material, stories and inspiration in Living Emunah 2, we’ve put together a sampler with some pages for you to enjoy. Don’t forget: ArtScroll’s Chanukah Sale Continues! Click here to shop!